Owl City is an electronic/pop project of Adam Young. Formed in early 2007, in Owatonna, Minnesota, Owl City has reached the Top Unsigned Artist position on Myspace, having over 10 million total plays. Owl City's first major label album Ocean Eyes was released digitally in July 2009 by Universal Republic. The first single "Fireflies" was chosen as the iTunes single of the week, and it generated intense interest in the album. Ocean Eyes featured guest vocals from Relient K's Matt Thiessen on four songs. It reached #27 on the Billboard Top 200 album chart and "Fireflies" began climbing the Billboard Hot 100. By October 2009 "Fireflies" was a top 10 smash. Young maintains two side projects, Swimming With Dolphins, and Port Blue. 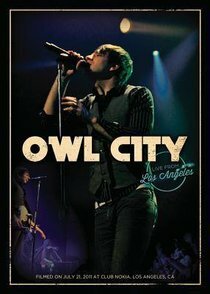 Customer Reviews For "Owl City: Live From Los Angeles"
If you're an Owl City fan then you've definitely got to get this DVD! Most of the songs are similar to the album versions but include creative introsoutros and other musical parts which sound amazing! The actual performance is pure awesomeness...Adam Young knows how to put on a great show!